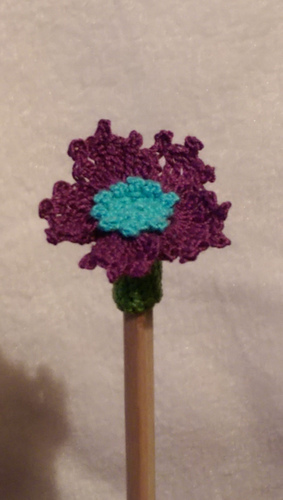 in 10 single crochet stitches wrap around object snuggly. Fits the standard issue pencil. Can be adjusted to fit fingers. 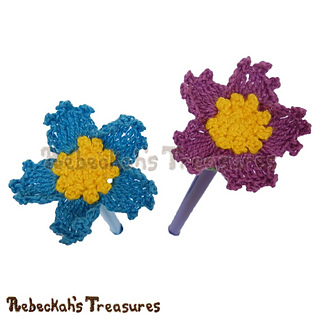 Looking for quick and easy last minute gifts to crochet? 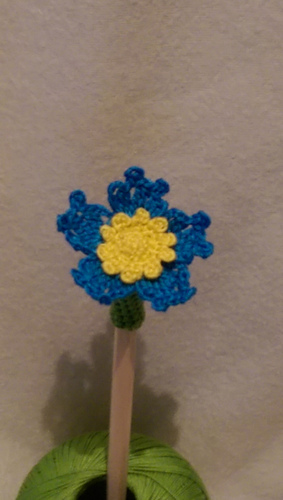 Try this stunning Forget-Me-Knot Flower Pencil Topper pattern. 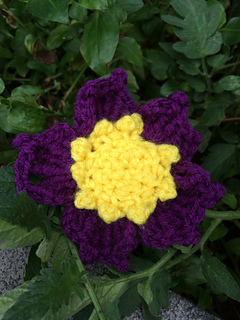 It’s fun for all ages and perfect for last-minute gifts or bulk gifting events! 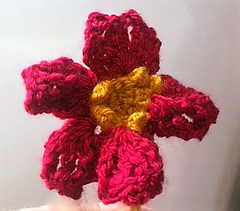 This minutes-to-make pattern includes written instructions and photo tutorials for crocheting a floral pencil topper for standard issue pencils and pens. 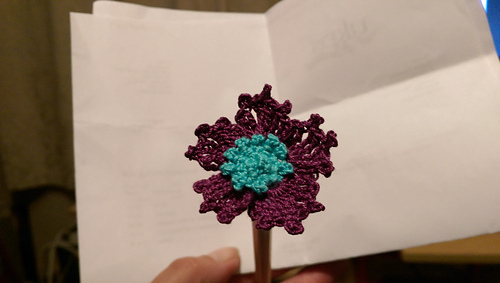 Plus, tips are included for turning this topper into a finger puppet instead! Gifting ideas include stocking stuffers for Christmas, trick-or-treats for Halloween, party favours and back-to-school accessories. 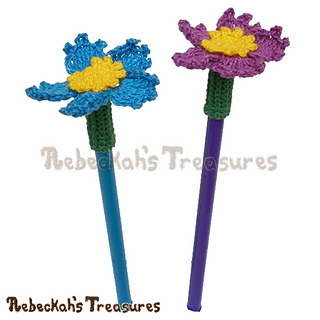 My favourite idea is to make several for a Teacher’s appreciation bouquet with various stationery staples in a coffee mug! 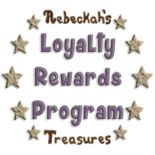 Always FREE online viewing via Rebeckah’s Treasures’ web-based blog. 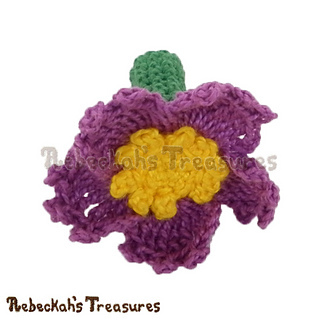 4-page, printer friendly PDF digital download - ONLY $1.75, OR SIGN UP for Rebeckah’s Newsletter and grab this pattern or another of your choosing (from the loyalty program list) for FREE in the next edition! 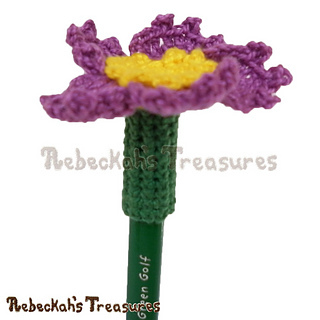 Designed to fit a standard pencil or pen when using lace weight yarn. 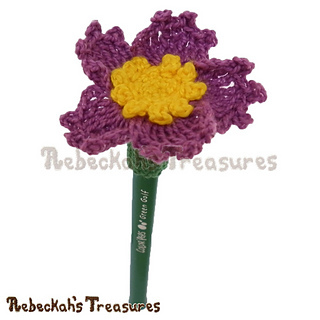 The base of this pencil topper, the part that slips onto the pencil, is approximately 1” (2.5 cm) in height. 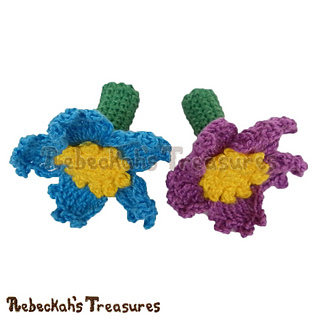 Sizing can be adjusted by changing yarn weight and hook size. 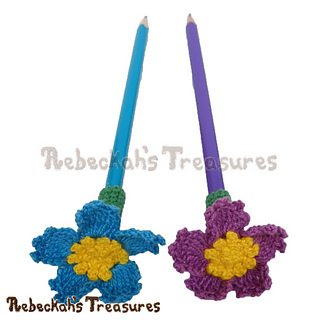 TIP: Use lacy, fine weight yarns for pencil toppers and thicker yarn weights such as DK or WW for finger puppets or teacher’s chalk.